This is a little treat that was made by neighbors of mine several years ago. They told me that they used 37 boxes of Ritz crackers for their total, then wrapped them up decoratively on beautiful little platters and gave them to friends/neighbors for Christmas! I was lucky enough to be one of them! I used to make a Chocolate Covered Peanut Butter Ball for Christmas when my children were younger and these are a a quicker version that taste very similar. I think I like these better because there is a little salty crunch to go along with the chocolate and peanut butter flavors. Out of all the cookies I made for Christmas this year, these were the biggest hit! Not to mention the easiest to make!! 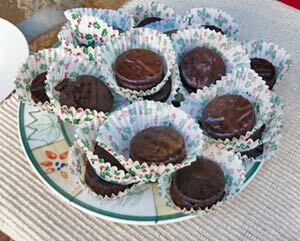 Use two Ritz crackers with Skippy peanut butter spread between them, as in an oreo cookie! In double boiler, melt a 12 oz. pkg. of chocolate chips thinned with half a bar section of parafin wax. 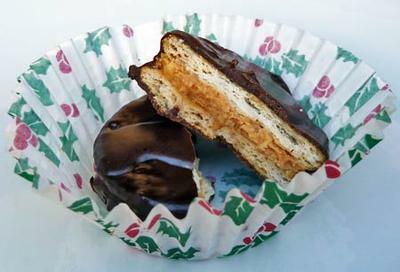 When totally melted and blended, dip each "cookie sandwich" into the chocolate and then lay on waxed paper to cool and harden. For Christmas this year, I placed each one (once cooled) in a festive cupcake paper and made a plateful to go along with the cookies! Very festive, and quite good for those peanut butter fanatics!